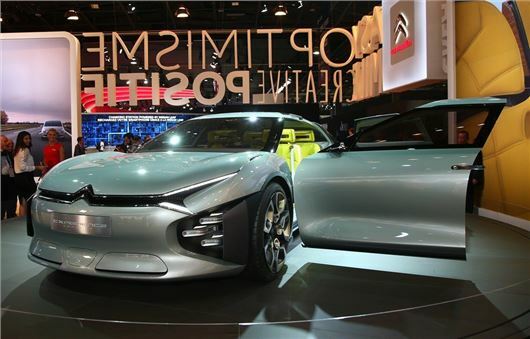 Citroen has caused a stir at the Paris Motor Show 2016 with the Cxperience concept. The plug-in hybrid is expected to form the basis of the C5 replacement, due in 2018. Like the original CX, which was produced from 1974 to 1991, the Cxperience focuses on comfort and practicality, with a large interior and body-hugging seats, made from flexible shape-memory foam. The wide windows and twin sunroofs also run the full length of the car, filling the interior with natural light. LED ambient lighting and an air purifier will contribute to making the cabin a "feel good" place, according to Citroen, while in-car connectivity has be taken to a new level, thanks to three touchscreen tablet that will allow the passengers to set the air con and access digital radio, MP3 music and movies. The plug-in powertrain uses a 150PS petrol engine in the front, connected to a 80kW motor, to drive the rear wheels. Citroen claims an all-electric range of 40 miles on a single charge, although there are no details of what batteries the Cxperience uses or how long they take to be replenished. The C5 was axed in early 2016 due to poor sales, but Citroen hasn't given up its large saloon and hatchback aspirations and a new, improved C5/CX is expected in the UK before the end of 2018.